Did God Allow the Attacks on 9/11 for a “Greater Good”? Shortly after 9/11, people were seeking answers about why God could allow such a terrible tragedy. Some Christians made some unfortunate comments, attributing the tragedies to the judgment of an angry God. Others said that God had some mysterious purpose in allowing it to happen. We were told that somehow he was going to bring about a greater good through it. The “greater good theodicy” is a common Christian response in the attempt to undercut the atheistic argument from evil. But is this answer a good answer? While I certainly don’t disagree that God can and does at times bring good out of evil, I’m convinced that the greater good theodicy is plagued with problems. First, let me define some terms. A theodicy is defined as “The vindication of divine goodness and providence in view of the existence of evil.” The defender of the greater good theodicy wants to deny that there is such a thing as gratuitous evil. They would say that God allows only that evil into this world from which He can bring about a greater good or prevent a worse evil. Gratuitous evil is basically defined as evil that does not serve a greater good or purpose. The greater good theodicist would claim every moral evil works together to serve the greater good. So where does the trouble lie for the greater good theodicy? For starters, we have no way to show the skeptic that a greater good obtains. There is no evidence to support the claim. In the example of 9/11, one might respond that 9/11 led to a lot of positive changes in our nation’s awareness of terrorism and security, but how many lives lost exactly did it take to cause such changes to come about? Couldn’t it have been that many more people had been spared in order for such changes to take place? Furthermore, there is no objective criteria for measuring the good. How do we know how much good counterbalances a particular evil? We don’t. The greater good theodicy also seems to undermine the doctrine of petitionary prayer. If God wants us to suffer from such things as terrorists attacks to bring some sort of good out it, why bother praying for such a thing as the protection and safety promised in the 91st Psalm, or asking him to heal those effected by the tragedy? The greater good theodicy also seems muddy the waters in alleviating the suffering of our neighbors around us. For if God has allowed certain evils for a greater good, why should we work to stop injustices when greater goods will ultimately come about if we simply allow them to happen? When faced with questions about tragedies of a similar nature, Jesus did not appeal to such reasoning. We must all be ready to meet our Creator, to whom we all must give an account of our lives. Jesus put the focus on the condition of our hearts and the brevity of our lives. God unequivocally condemns evil, and he came to redeem us from evil if we freely choose to receive him. Instead of looking for some greater good to come from atrocities such as 9/11, we should be looking to spread the mercy and love of God to those hurting around us. The Point: Christianity and 9/11: Guilt by Association? Sarcastic Xtian: Do all roads (and flights) lead to God? 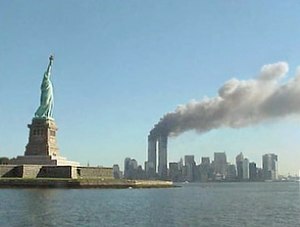 Apologetics Guy: America After 9/11: Is Religion Evil? Neil Mammen: Where was God on 9-11? Cold and Lonely Truth: 9/11: Where is God during a catastropy? Clay Jones: Are We All Moral Monsters? This entry was posted in problem of evil and tagged Problem of evil, September 11th, theodicy by Erik Manning. Bookmark the permalink. Pingback: On September 11th, 2001, harmless things became fearful « J.W. Wartick -"Always Have a Reason"
As you know, Erik, I found this post really interesting. On a case-by-case look, it seems the “greater good” would quickly break down. I could see a small amount of animal suffering being allowed for the “greater good” of sacrifice in the OT, for example. But if one were to argue that a little child’s kidnapping and murder could be “for the greater good” seems downright wrong. I would like to ask: Do you think that one could argue that the sum total of evil could be allowed for a “greater good” like the redemption? It just popped to mind and I’m wondering if a greater good theodicy could be used as an “overall” good instead of a case-by-case outline. Hmm….I don’t think that one could argue that the sum of evil could be allowed for a greater good, such as redemption. For the sum total of the evil would include that seemingly pointless event of the child’s kidnapping. So we wouldn’t say to the parent that God allowed this for your greater good, which does sound terrible, we would then say God allowed this for the overall good of his redemptive purposes. which seems a bit absurd. It then also makes that particular act of evil necessary for the overall good of God’s redemptive purpose, but I think Christ’s atonement was enough. Obviously the crucifixion is the greatest instances of God bringing good out of evil, but the case of the cross and others that may be referred to in scripture (like Joseph) doesn’t prove that God brings good out of every evil. If I’m misunderstanding you, please feel free to clarify. First off I just want to say that I really enjoyed reading this. I love seeing Christians really thinking about the world in light of the gospel and not just secularizing topics like this one. It was very thought provoking. To say that anything including evil is “pointless” seems to go against the nature of an ordered reasonable logical God. We may not see the point, but I think to say that God does anything for no reason at all goes against His character. And there is a third option for evil besides “pointlessness” and “for our greater good.” I would argue that the greater good of humanity has little to do with why God does things. I think the all-encompassing reason behind every one of His decisions is to bring Himself glory. So even if we can’t see a greater good on our end, He is ultimately using it to glorify Himself. And you are right, He is justified in doing that. I think your point on the necessity of evil is very interesting and I guess a new line of thought for me. It does seem wrong to say that evil is necessary. That’s like saying that God created humanity because He needed us, which is heresy. God doesn’t need anything. Good things to think about. Thanks for the post. Thanks for the comment, glad you enjoyed the post. While I think I would agree that what God does brings him glory, I’d make the distinction that what he allows and what he actually does are different things. I think what brings God the most glory is him choosing to make a world where moral agents like Himself who had the power of choice, and where people can interact with him freely. I think he gets more glory by honoring that power of choice and working within the world which he created to redeem as much as possible from it as people co-operate with him. I go a little beyond that, as I believe God also he has placed within the church a certain amount of delegated authority through prayer, so that in some sense we are responsible for some of the things that happen where we are directly involved. I actually realized after I commented that I should have made that distinction. I was referring to Gods decision to allow evil, not Him causing it. I still feel like there is an issue with your statement “Because we live in a fallen world in which the curse is a very real, pointless evil is possible and God is justified in allowing it.” Can pointless evil exist when our reasoning God is in total control over evil? I think we are struggling over an issue of the sovereignty of God vs. human responsibility which is tricky business. We have free will but we will always freely choose sin. Evil comes about by God allowing us to make that choice while goodness is God intervening and helping us choose Him. If God “honored the power of choice” we would all sin all the time. He redeems us not by people “co-operating” with Him, but by over-riding our natural desires to sin and drawing us to Himself. I realize this boils down to a huge debate that has been going on for centuries. I don’t want to get bogged down in it. I also don’t want you to get the wrong idea, I agree with 99% of your post. It’s that one concept of pointless evil that is bugging me.